The Lady Campers shared stories around the campfire eating honey roasted chicken as Allegany cooked the Hive during a 72-20 victory over the Yellow Jackettes in Moorefield on Tuesday night. Moorefield struggled from the field missing 32 shot attempts and committed 27 turnovers and Allegany took advantage of the miscues. The Lady Campers went up 12-2 in the first four and a half minutes which included a 3-pointer by Morgan Chaney before a timeout was called. That short break helped Moorefield strategize for a pass from Anna Riggleman to Emma Baker, who nailed a trey. After Allegany’s Taya Sloan scored her third field goal of the frame leading to a game-high 23 points, the Yellow Jackettes found an opening along the perimeter once again. Makena Humbertson blocked a shot, but Riggleman recovered the loose ball and found Madison McGregor for a 3-pointer as Moorefield cut the deficit to 14-8 at the 2:15 mark. However, the Lady Campers would score eight points with six coming off of turnovers to build a 22-8 lead. A putback attempt by Moorefield’s Remi Hinkle got stuck on the rim, but Lindsey Rinker added a jumper with five seconds left, 22-10. Moorefield’s Nautica Crosco stole the ball back from Sloan, who had just intercepted a pass and went in for a layup to make it 24-12 at the 5:41 mark of the second period. Moorefield’s Emma Baker blocked a shot and took the ball down the floor, but the Yellow Jackettes failed to create a point. Sloan netted a 3-pointer after a Moorefield turnover to give Allegany a 29-12 advantage. Rinker dashed across the paint making a running jumper as the Yellow Jackettes fought to close the gap. Moorefield’s Gianna Fair made a putback on the ensuing possession, then the Lady Campers responded with three field goals by Sloan and one was created off a turnover, 35-16. Riggleman snatched a rebound off a missed free throw, then tossed to Baker, who found Crosco for a score. Sloan swiped the ball and walked, but collided with Riggleman and was sent to the line making one foul shot. 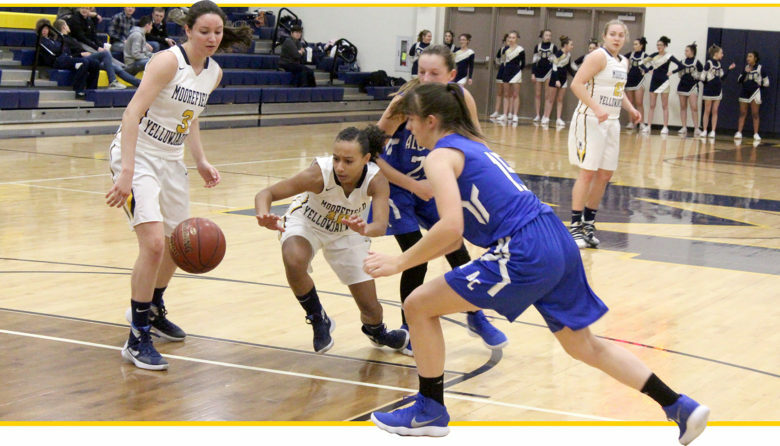 Riggleman would collect the rebound, but missed the mark and Fair’s rebound didn’t purchase a basket before the close of the half as Allegany took a 37-18 lead into the locker rooms. Moorefield didn’t score again until 1:46 remaining in the game as the Lady Campers went on a 31-0 run. Allegany cleaned the boards and were quick creating steals to blank Moorefield 19-0 in the third quarter. 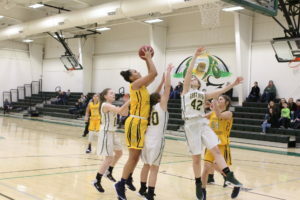 Lady Campers guard Gabby Rumgay connected on two perimeter baskets in the third frame and Emily Fradiska added six points as well during that time. Fair blocked three shot attempts early in the fourth quarter for the Yellow Jackettes, but Allegany still found ways to score keeping the run alive. Moorefield’s Ciarra Smith’s two free throws with under two minutes remaining were the only points of the second half for Hive dwellers. The Lady Campers added two more field goals Rimgay and Alayzia Ward to close the game for a 72-20 final. 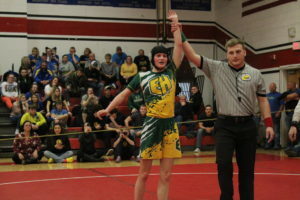 Rinker led the Yellow Jackettes with six points, followed by Crosco with four markers. 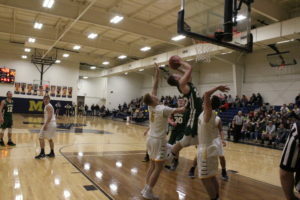 Moorefield didn’t have much time to recover from ailments with a battle against Strasburg on Wednesday night.